Photo: This photo shows the Norwegian student satellite NCUBE2 ready for shipment to the Netherlands for integration with the ESA student satellite SSETI-Express, photographer, Bjørn Pedersen, NTNU. Acquisitions Directorate reports that the Coast Guard is planning to have two satellites launched to provide additional EPIRB detection capability primarily in the Arctic. Two small satellites, scheduled for launch in 2018, will provide the Coast Guard with the opportunity to test the effectiveness of satellite communications in supporting Arctic search and rescue missions. There is more in the linked article. 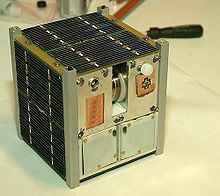 The satellites are cubes only 10 cm (3.9″) on a side. It is impossible to have geostationary satellites over the poles so coverage will be intermittent. This entry was posted in ISR, Maritime Domain Awareness, SAR by Chuck Hill. Bookmark the permalink.